This month my daughter and son-in-law (newly weds of three weeks) decided to move halfway across the country. They had discussed it for a while, but the decision was abrupt because they either had to renew their house’s lease – or not. They came through town and stayed here two days, a Thursday and Friday. On Thursday, Daughter sent off resumes to school principals; on Friday, a principal called and set up an interview on Monday. Saturday, they traveled 20 hours to their new city. They found housing through Couch Surfing. Monday’s interview went well, so she was asked to teach a sample class on Thursday. That morning, before the interview they signed a year’s lease on an apartment and she showered in the new apartment before teaching the sample lesson. She was invited back for a final interview on Monday, after which they called her references and she was offered the job – one that exactly suits her. In ten days flat, they went from one city to the next, found a job, housing and are set up while her DH enrolls in school and looks for part-time work. And I ask myself: am I willing to take a comparable risk in my writing career. Yesterday, I took steps to try something different, to do a different sort of writing than I have ever done before. With my daughter’s inspiration, I’m taking a risk. Are you? What risks have you taken before in your writing and how has it paid off? Have you written the novel you were scared to write because you might not do it justice? Have you sent to editors/agents you were sure would never buy from you or take you on? Personally, I’ve been a huge risk-taker my whole life. I thoroughly research and ponder, but in the end I plunge in. I’ve never regretted it. When it comes to the writing, it’s not so easy. I would like to write a thriller, with bodies in the attic – that kind of thing, but haven’t quite jumped in feet first yet. In any case, I still have too many other things to write about. Perhaps one day the thriller will come as a total shock to my readership, when and if I ever have one! 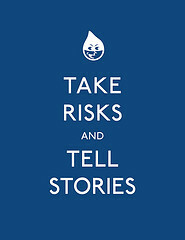 Interesting that the one place you’re reluctant to take risks is the writing! It’s such a risky business anyway!